Little Fawn Group Camp is located on the south end of Elk Lake, one of the largest and most popular of the Cascade Lakes. Elk Lake has a picturesque setting, with the Three Sisters Mountains towering over the north end of the lake and Mt. Bachelor dominating the eastern horizon. Nestled in a diverse stand of mixed conifer forest, the brilliant, transparent water of the lake offers visitors a clear view to the bottom. Little Fawn Group Camp offers single-family sites and a group site that are all close to the water. The campground accommodates tent and RV camping with a mix of pull-through and back-in sites, but electrical hookups are not available. 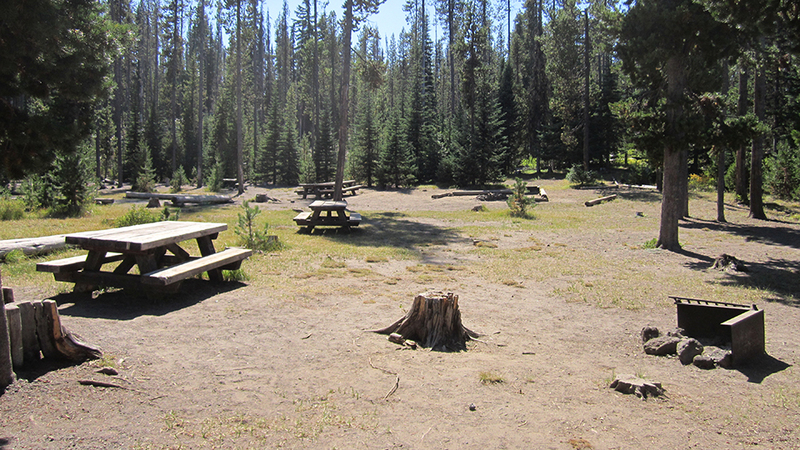 Open seasonally, the campground is located on Little Fawn Cove, a large cove off Elk Lake. The water is warmer than the larger lake and fairly shallow, but depending on the snow year, that means the water levels can also be very shallow (to marshy or dry). There is a large beach area that gets a lot of traffic from day-users.